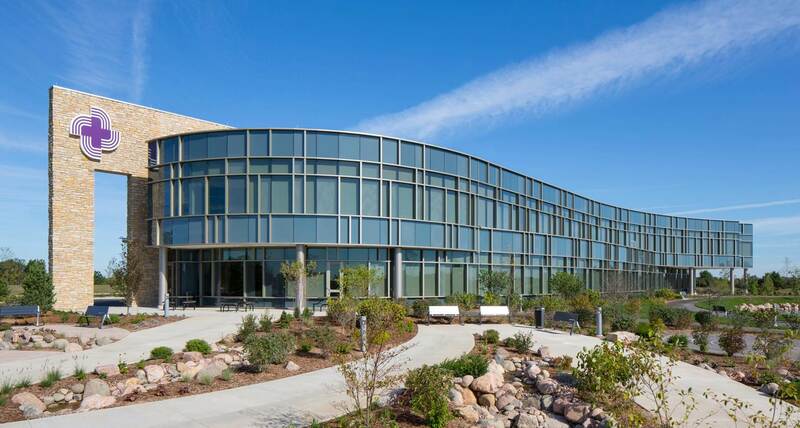 ESA programmed and designed this major outpatient cancer center in conjunction with the University of Wisconsin and local architect-of-record Saavedra Gehlhausen Architects. The facility accommodates a full range of services, including radiation therapy and infusion treatment. It also houses physician offices, exam rooms, a retail pharmacy, imaging equipment, and two linear accelerators. There are many options for patient privacy including private, semi-private, and open rooms. Amenities include waiting areas with fireplaces, a café, and retail spaces. A patient resource and education center provides computers and internet access to facilitate research on medical conditions and resources for support. The 25-acre site features tranquil green spaces, healing gardens, and water elements. The architecture, materials, and finishes are inspired by the rural character of the surrounding area.